It is always a pleasure to host a new game on Board Game Arena, but sometimes we get the chance to be particularly proud about a game adaptation. 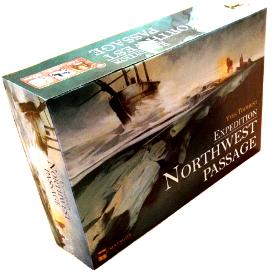 This is the case with "Expedition: Northwest Passage", a game from Yves Tourigny published by Matagot. Why? At first, we've been 100% convinced by "NWP", which is the result of two years of work between the designer and the publisher. Then, the publisher Matagot gave us this unique possibility to have the game here a few months in advance before its official release! And finally, the online adaptation realized by Thierry Arnoux (Tirix) is really, really good Thank you Thierry! So, what about the game? NWP is a game for 2-4 players with an intermediate complexity. Each player is leading an expedition and a crew trying to discover the legendary "Northwest Passage" from the Greenland coast. To achieve this goal, you have to find a route for your Ship and your Sled through the icy maze of islands which make up the Arctic archipelago. Because of the Artic winter, the sea can quickly become pack ice and passable by Sled... but impassable by Ship. Needless to say, you will need to manage well both vehicules to win the race. But winning the race is not enough. Once you managed to cross the board to the Northwest Passage, you still have to get back with all your crew members before the end of the game, otherwise they will turn into ice cubes and that will get you some big penalties. In addition, there are many ways to gain points during the game by discovering various items and charting islands. The best expedition is not necessarily the fastest one! A big "thank you" to the whole Matagot team for giving us this opportunity to share with you this wonderful game!